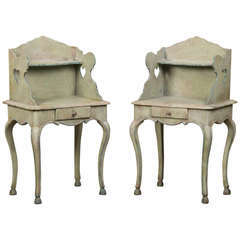 Be the first to see our new selections direct from 1stdibs! Please click on follow below. A splendid antique English Regency period Sheraton style mahogany side table with a single board top from England, circa 1820. 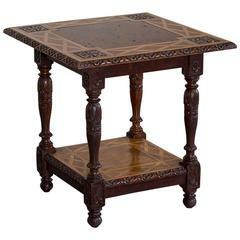 This supremely elegant table has a delicacy and fineness to its profile that is enchanting to behold. The design of the table features the three spade feet made famous by the designer Thomas Sheraton who published an extremely influential book of furniture designs beginning in 1791 called "The Cabinet Maker and Upholsterer's Drawing Book". These four volumes offered a new design esthetic that proved irresistible to clients in England and the Americas. The gorgeous table seen here takes advantage of this new emphasis on grace and elegance. The circular top is made from a single board of mahogany timber with a single groove that runs around the entire side edge to give an impression of light and shadow as it reflects the available light within a room. The importance of a single board top cannot be overstated as it is only possible to have a top of this size if the original mahogany tree was sufficiently large enough to offer the width necessary for this size of top. The surface shows the customary fading of the timber from years of use and is in contrast to the original deeper colour of the column base and three legs. This change in colouration is integral to the appeal of this table as it offers certain evidence of its age and use within a household. The tabletop stands upon a turned column whose slender profile is offset with a series of ring turnings and a vase form at the base of the column. The superb balance of scale is further seen in the three square legs that each descend and move away from the column in a most attractive way to each terminate in a square spade foot. The elegance of this table lies in its lack of superfluous ornamentation and concentration on only the qualities necessary to create a balanced and symmetrical design that is equally striking no matter from which direction the table is seen. A table of this particular size and beauty was always used within a room to be moved around the space as necessary as it could accommodate a variety of uses. Now this table continues to offer beauty and function in either a contemporary space where the clean lines possess a modern appearance or in a more traditional space. 1820s Regency style mahogany side table with an octagonal tabletop, two drawers, and brass hardware. The body also features a faux bamboo pedestal, and four sabre legs.